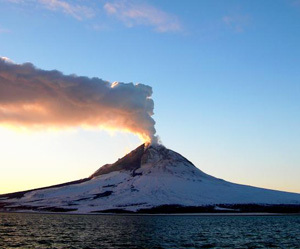 The Alaska Volcano Observatory monitors earthquake activity at Augustine volcano (above), which erupted most recently in 2006. Photo by Cyrus Read, image courtesy of AVO/USGS. Brodsky presented recent findings on pre-eruption earthquakes on Wednesday, December 16, at the fall meeting of the American Geophysical Union in San Francisco.